On October 4, John Padberg, SJ, noted historian and former editor of Jesuit Sources, visits the Institute for Advanced Jesuit Studies at Boston College to deliver the second installment of the Feore Family Lecture Series on Jesuit Studies. 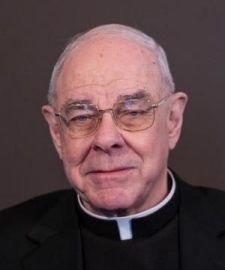 Padberg’s lecture–entitled “And Then What?”–considers ath happened to the Society of Jesus and its members in the aftermath of the order’s papal restoration in 1814. To learn more about Padberg and his remarks, please visit the Institute’s website. Update: A video of Padberg’s lecture is available online: http://frontrow.bc.edu/program/padberg2/.